Preheat oven to 400 degrees F and arrange the racks to divide the oven into thirds. Prepare 2 baking sheets by lining them with parchment paper and set aside. Wash and peel the potatoes and slice them into 1-inch chunks. Place the potato chunks in a large saucepan and cover with cold water. Generously salt the water and bring to a boil. Reduce heat to medium and simmer potatoes until tender, about 15 to 20 minutes. Drain the potatoes in a colander and return the potatoes to the pot. Mash with an electric mixer until smooth. Then mix in the egg yolks, one at a time, with a rubber spatula. Add the butter, cream, salt, pepper, nutmeg, and 1/2 cup of cheese. Stir until well combined. 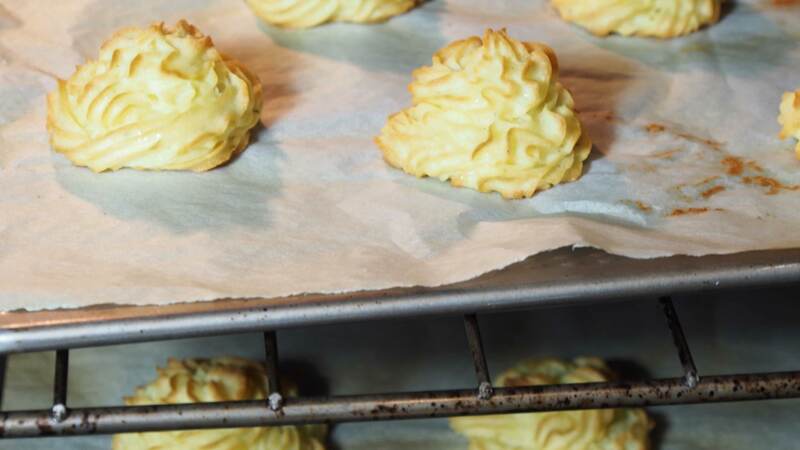 Transfer the potato mash to a piping bag fitted with a 1/2-inch star piping tip. Pipe 12 round mounds onto each prepared baking sheet leaving space in between each mound. Sprinkle the mounds with remaining 1/2 cup of cheese. Bake both sheets for 20 to 25 minutes or until the tops of the potatoes are a light golden brown, rotating half way through.